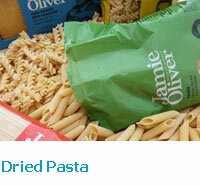 Jamie’s spaghetti, penne, fusilli, lasagne and conchigliette are great partners for any pasta sauce. The pasta is made by a specially selected producer in Sardinia, Italy, also known as one of the pasta best milling sites in Italy; using durum wheat semolina. The Lasagne is produced in Verona, using free-range eggs (19%).